Cattaneo Commercial have just secured the letting of 26C Lyon Road, Hersham Trading Estate, Hersham, Surrey KT12 3PU. 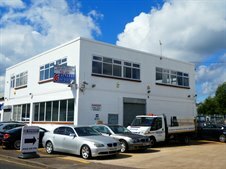 This 4,316 sq ft, two storey unit comprises 50% workshop and 50% offices with 13 car spaces. The unit has been let on a new full repairing and insuring lease to a Korean Dental laboratory. We have further units on the estate to let. For more information contact Andy Armiger on 020 8546 2166.